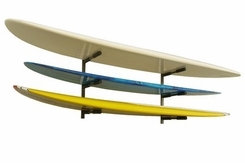 SUP Triple Rack: classic rack, strong and durable storage for 3 boards. Each arm is 21" long and built to hold boards 35" wide, and the space between the rack arms is 11" inches; this rack is built for some serious boards. As a bonus, the rack arms are removable, so the rack can have a low profile in your garage when you're not using it. 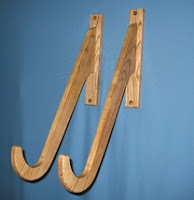 If you want the "premium version" check out the SUP wood triple storage rack. SUP Wall Rack: standard, wooden wall mount single rack to keep your board safe on the wall of your garage or as a display option in your house or on your porch. Angled arms allow you to store your SUP board with the fin in place and also allows for quick in and out without thought or effort for the early dawn patrol sessions. SUP Ceiling Rack: solid, steel rack gives you another storage option in an unused space, your ceiling. We know SUP boards are big and bulky and maybe you don't have the wall space but you probably have the ceiling space for SUP storage. Also, this rack comes in "expanded versions" to fit multiple boards - check it out! Explanation of stacking with full dimensions and pictures on our website. 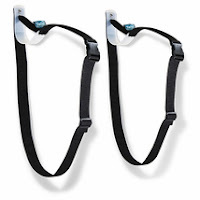 SUP Straps Rack: an interesting variation on the traditional solid rack, these straps mount to your wall and give you a flexible but affordable ($49.99) storage alternative. Don't worry about the durability of the straps, they are super tough 2 inch nylon straps that are also built to hold kayaks. Big key on this rack is that there is a small arm piece on top that works so that the straps are always open and spread for easy entry for your board - no fumbling around to get the straps open and dinging your board in the process. How-to video on our website. 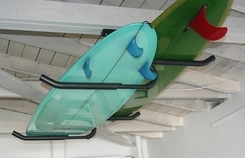 Looking for a variation on one of the racks shown - maybe you want one in black or wood - we've got more varieties and options on the SUP rack page of our website, check it out!